For thousands of years the rainbow and the symbolism it incorporates has been viewed with a sense of awe, wonder, and inspiration. The shimmering and glistening colors that emanate from the perceived “path of the gods” have been illuminating and inspiring ancient cultures, mythologies, poets and artists for thousands of years. 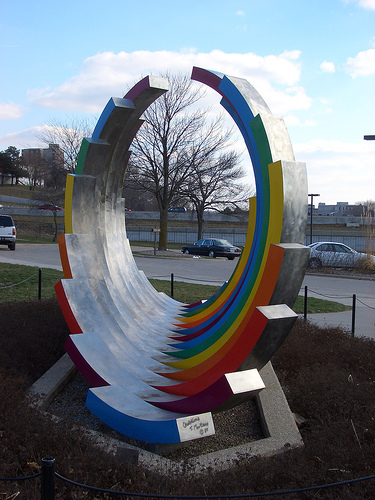 Symbolically speaking, in mythologies worldwide the Rainbow Bridge, or the “Shimmering Path” as it is sometimes refered to, was seen as a link between the earthly realms and the heavenly realms — the Rainbow Bridge was considered a pathway connecting humanity to the gods, and possibly even a bridge between our everyday selves and our higher selves. Before delving into the mythology of the Rainbow Bridge, as well as the re-emergence of the rainbow in modern art, architecture, and pop culture, I would first like to share a few personal experiences that have urged me to take the quest down the rainbow path. Back in early 2005 a string of synchronicities following a best friend’s untimely death lead me into a full fledged investigation concerning the possibility of the existence of both “alien” visitors and their craft. I experienced a personal U.F.O. sighting back in 1999 while living in northern Michigan. While this first and initial experience rattled me I was still able to push it to the back of my mind and forget about it for the most part. That being said, five years later, I had an intense urge to know the truth. It didn’t take long after reading, and listening to thousands of credible testimonies from U.F.O. witnesses, as well as conducting a host of interviews on my own, to realize something was taking place. What, that “something” was – I had not a clue. If asked at that point what my personal belief was in regard to the phenomenon I would have probably strongly responded that I believed something was taking place. But until something truly shakes your foundations through the form of a personal experience the word Belief doesn’t contain the same significance. In 2005 I was driving home from a Zecharia Sitchen conference in Chicago when my world changed forever with such an experience. East bound on I-94 I was headed for home in Detroit. My mind seemed to be at bliss, driving and singing along with Bob Marley’s ‘Redemption Song’, and contemplating how much life had changed in such a short amount of time, and how thankful I truly was. As if out of nowhere a light mist began to fall from the sky and within a matter of moments an enormous double rainbow in all of its beauty took form in what appeared to be directly over the highway. What was a good mood only moments ago had now shifted to that of ecstasy and amazement! The rainbow slowly crept along the rural landscape and what appeared to be the “end of the rainbow” emerged on to the freshly wet paved highway. Surely there is a good scientific explanation for what was about to occur next, but the feelings and the emotions the rainbows were about to transmit were beyond imagination to me in that moment. The colors of the rainbows, in all their brilliance, began to refract from the wet concrete and illuminate the entire inside of the car, and even the immediate exterior surroundings. Observing the interior of my truck and myself glistening in the colors of the rainbow the thought crossed my mind, had I lost it? Looking around at the congested traffic and the passengers in near-by cars I quickly realized others were having the same experience. It seemed highly unusual that I was now only traveling around 24 to 30 mph in a 70 mph zone, and even stranger no one was passing me. The other drivers must have also been engulfed in the experience. Suddenly a very strong urge to exit the highway came over me, and I found myself veering off at the next exit. In the rearview mirror I realized there was an unusual amount of traffic exiting also, especially for such a rural area. Recollection escapes me on where the large line of cars went, but it surely wasn’t in the parking lot that I pulled into. Pulling off the road at the first available safe area I began snapping pictures of the double decker rainbow in hopes of sharing the experience that evening with my wife. Calling home immediately after the experience, I related to her what an incredible experience it was, and my awe at the beauty just witnessed. When I got home that evening the rainbow photos among others were a distant thought behind visiting with the family and getting some much needed sleep. It was at precisely 3:07 A.M. when I awoke from the most vivid dream in my recollection. Not being a vivid dreamer it was quite startling to me that the dream seemed so real, and the recollection of it seemed more like a memory than a dream. In the dream a voice came from a being that seemed to be just outside my visual range, and although I couldn’t see it, I could feel its presence very intensely. 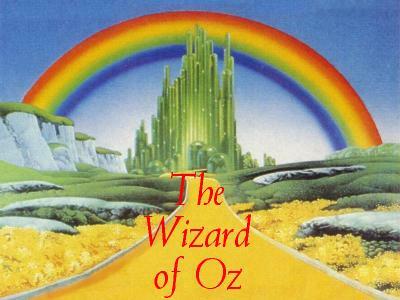 The voice relayed through audible sound and feeling, “Investigate the rainbow”. 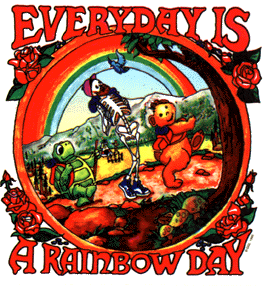 I then began floating toward the same double decker rainbow I had witnessed the previous day. Now floating literally between the two rainbows, another message or transmission struck me. 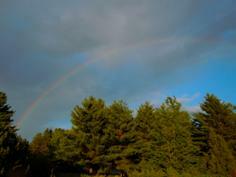 This time I heard no voice but received the clear message directly into my head telling me to check the rainbow photos. Still dreaming I somehow had the awareness that I needed to remember this info until I awakened, even wondering how I could wake myself up. Just then an orange-ish red U.F.O. came flying out of the rainbow headed in my direction and I was instantly shaken to awaken! “What the *!#! was that?” was my reaction as I sat up abruptly in bed. And as crazy as I know this sounds, just for a moment it seemed as if there was some kind of presence in the room with me. To say this startled me would be an understatement to say the least. Up until that point I remembered very few of my dreams, let alone having intense realistic feelings that accompanied them. Not knowing exactly what to think or how to react, eventually I rolled out of bed and moseyed across the hall to the computer room and began downloading the past weekends pictures. Sitting there at the computer at around 3:30 in the morning this unusual behavior made me begin to wonder for the second time in 24 hrs if I had lost my mind. I was just about to return to bed when there it was, a familiar image that immediately shook me to the core. 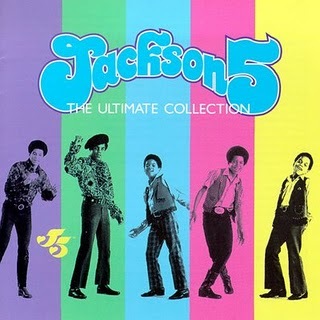 The same Orangish U.F.O. that brought me out of my dream state was captured in the rainbow photo. 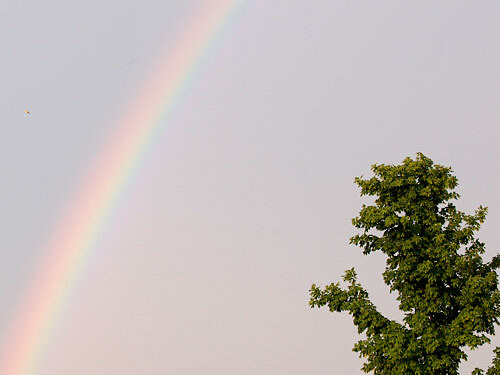 The object clearly appears just to the upper left of the rainbow and even appears to have some kind of distorted field surrounding it. And if that wasn’t enough, just to the right of the first craft appears a larger object but more in the form of a shadow, for lack of a better description. At first I considered could this have been an orange leaf caught in a strong gust of wind, but quickly dismissed that possibility considering it was summer time and the leaves in the foreground of the photo were bright green. I also checked the photos before and after to make sure there was nothing on the lens and this also was not the case. For me personally I could not explain this one away. The feelings and emotions that had flooded over me the previous day as the rainbow experience was actually unfolding, in conjunction with having a dream so realistic and intense that it literally awoke me from a deep slumber and persuaded me to start downloading photos in the middle of the night to ”investigate the rainbow” – incomprehensible! Then topping it off finding in the photos the very craft that awoke me from my dream – even more incomprehensible! It was that evening in particular that what little bit of skepticism left in me vanished, instantly disintegrating my prior belief systems. To this day I still reflect on what the experience was supposed to mean and have a feeling I probably always will. What I can tell you is that the authenticity and realism of the experience was felt through every cell and bone throughout my body. 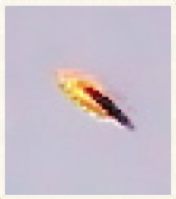 I’m not willing to step out on a limb and claim this was most definitely an alien ship from Alpha Centari, but I will say that this experience in some shape or form was a 100% real for me personally, no doubt! For years I questioned the reasoning behind this experience. I now realize that it was from that moment on both my life and outlook on life have completely changed. I now both view and experience the world in ways previously unimagined. Needless to say the next few years I took a keen interest in researching and investigating U.F.O’s and their possible occupants. That being said, in the back of my head was always the memory of the perceived transmission from the rainbow dream relaying to “investigate the rainbow”. And I must admit to having a rather unusual amount of rainbow sightings over those next few years. Getting back to my research at the time, as with many of our personal passions and interests, my interests gradually began to shift over the next few years. What began to truly peak my interest at this point was if the visitors and/or their crafts, or possibly even just the consciousness of these beings were traveling through space and time, how was this occurring? This idea in a round about way lead me to the incredible work of Investigative Mythologist William Henry (http://www.williamhenry.net/). William has been picking up the clues left in ancient myth and lore regarding stargates and gateways among other topics for over 15 years. After attending several of William’s lectures we eventually struck up a friendship. Over the next few years William became an amazing mentor as well as inspiration to me, giving advice and ideas that have been literally priceless! Following William’s work over the years there was one thing in particular that really began to resonate with me and draw my attention. To my disbelief he was showing art and architecture that contained stargate and gateway symbolism. 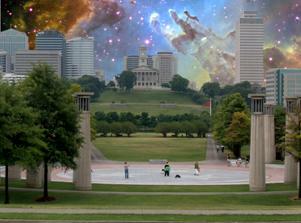 In particular he was focussing on a “Stargate Park” in downtown Nashville called The Bicentennial Mall. For more information on Stargate Nashville please read: William Henry’s article (City of Secrets). In 2008 I made the journey from Michigan down to Nashville for the first Dreamland Festival and finally had the opportunity to visit, or shall I say experience, Stargate Nashville first hand. What really stood out to me on my visits to Bicentennial Mall was how familiar the art and architecture as well as the symbolism it incorporated was to a park I frequently visited in my home town of Detroit. It was on this trip to Nashville that I began to view some of the astonishing art and architecture that has emerged in our cities in a whole new light. After returning from Nashville I started to truly dig into some of the symbolism hidden in plain sight in my own backyard. 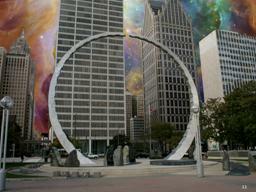 What I discovered is that in the heart of downtown Detroit a park had emerged, Hart Plaza, that contains an incredible amount of gateway, stargate, Egyptian, and astrological symbolism! To my amazement I discovered that not only was the plaza built upon a piece of sacred landscape, but was also aligned and correlated to both the Giza plateau as well as the constellation of Orion. If that wasn’t enough to ponder, at the en-trance to this cosmic temple sits an enormous sculpture entitled Transcending that highly resembles a classic stargate! For more information on Stargate Detroit please visit my previous article: Transcending The Gateways to Freedom – Stargate Detroit. 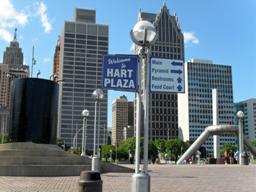 Although I had been visiting Hart Plaza for most of my life, I now viewed not only the park, but the city of Detroit from a whole new perspective. In a brand new light. At this juncture I truly believe this is one of the many powers these parks can have on both a personal and collective level, a change in perception. Long story short, I proceeded to write my second book The Mystical Mitten – Michigan’s Stargates, Temples, and Sacred Mounds of Transformation. Being the gracious mentor that he is, William invited me back down to Nashville for the 2nd annual Dreamland Festival and gave me the opportunity to sell my books alongside his. For a guy who hadn’t contemplated writing a book the year before, this was truly appreciated and a true honor. That being said, it was on my second road trip from Michigan to Nashville that I would find myself on the rainbow trail. There was one place in particular that I intuitively knew I needed to visit and investigate. St. Louis and the Gateway Arch! Driving into St. Louis and seeing the Gateway Arch glisten in the colors of the rainbow I immediately was reminded of the mythological “Rainbow Bridge”. As previously mentioned the “Rainbow Bridge” can symbolize the bridge between Earth and the Heavens, humanity and the gods. 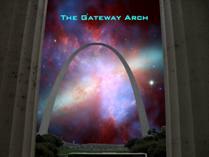 But first a little history on the Gateway Rainbow…I mean Arch! In the early 1930s the United States began looking for a suitable memorial for Thomas Jefferson (the Washington Monument and the newly built Lincoln Memorial were the only large Presidential memorials at the time). The memorial to Jefferson would eventually be placed on the actual location that was symbolic of one of Jefferson’s greatest triumphs — the Louisiana Purchase, clearing the way for westward expansion! The Gateway Arch is known as the “Gateway to the West”. It was designed by Finnish-American architect Eero Saarinen and structural engineer Hannskarl Bandel in 1947 and built between 1963 and 1968. 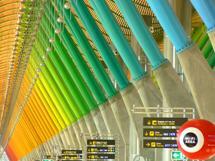 It is the only building in the world based on the catenary arch, making it the iconic image of the city. 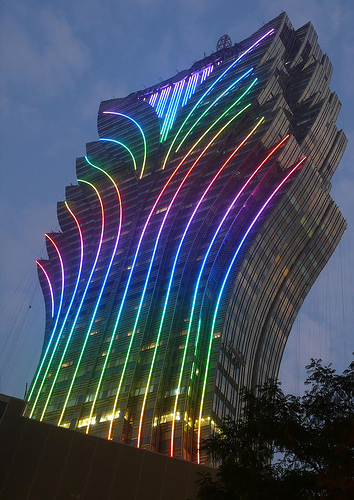 It stands 630 feet (192 m) tall and 630 feet (192 m) wide at its base. The Arch is a structure known as a catenary curve, the shape a free-hanging chain takes when held at both ends, and considered the most structurally-sound arch shape. Each year approximately a million visitors ride the trams to the top of the Arch. Just because the Gateway glistens in the colors of the rainbow doesn’t mean it is symbolic of the rainbow bridge, that being said I decided to journey into the underworld (basement) of the Gateway and take the tram ride to the top. I was curious if I would find any symbolism inside. 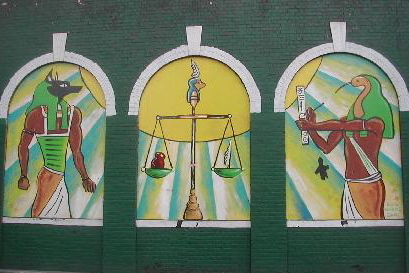 The Builders Mural was completed in 1997 by artist Jay Tschetter and measures 45 ft. long and 15 ft. high. It is dedicated to the artists and architects that made our national monuments as well as the Gateway Arch a realization. Looking closer at the mural you can see some of our nations national monuments including the obelisk in Washington, Mount Rushmore, The Gateway Arch, and the beautiful Statue of Liberty. Zooming in even further you realize there is one national monument incorporated in this mural that surely was not made by any of these skilled architects. Utah’s Rainbow Bridge! And Lady Liberty appears to be standing in front of or even sitting upon it! Rainbow Bridge is often described as the world’s largest natural bridge. The span of Rainbow Bridge spans a distance of 234 feet . At the top it is 42 feet thick and 33 feet wide. 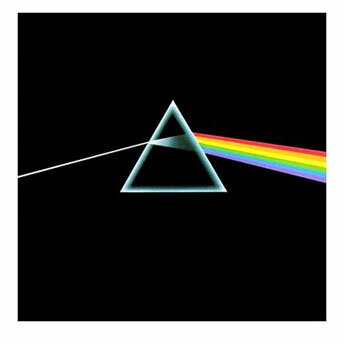 Ironically the literal rainbow is created by white light that is reflected and refracted at an angle of 42 degrees. Needless to say I was ecstatic about this discovery! Not only was there Rainbow Bridge symbolism upon immediate entry to the Gateway Arch, but the symbolism was highly similar to other pieces of ancient art portraying figures riding or sitting upon the “Shimmering Path”. 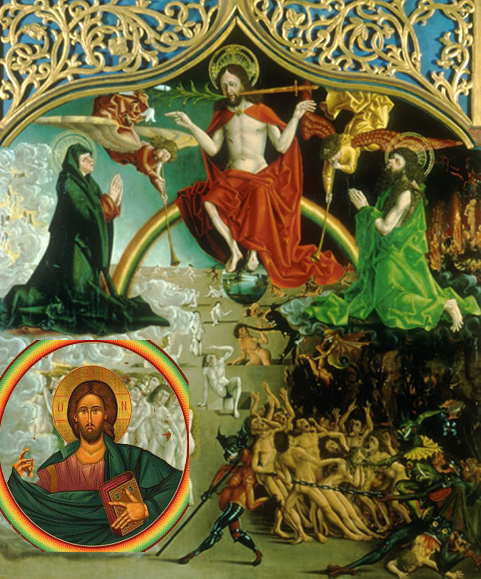 As Investigative Mythologist William Henry has pointed out, this symbolism is identical to that of Jesus being portrayed on the Rainbow Throne, and even George Washington hovering on the Rainbow Bridge in our Capital Dome. 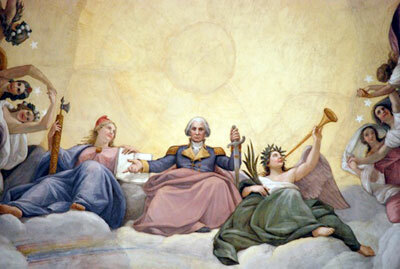 That’s right, the father of our country is portrayed as a deified being, riding a rainbow in our Capital Dome! And sitting upon the rainbow to George’s left is Lady Liberty! 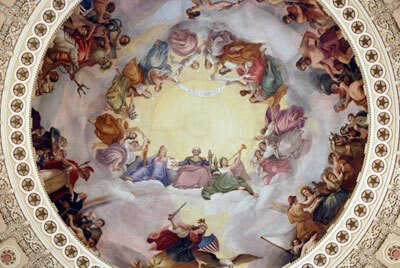 * For more information on William Henry & Dr. Mark Gray’s amazing discoveries in regards to Constantino Brumidi’s painting (The Apotheosis of George Washington) please visit William’s article: The U.S. Capital and the Temple in Man. 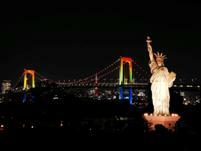 The Statue of Liberty is officially titled Liberty Enlightening the World, this title seems quite appropriate considering that not only is she found riding the Rainbow Bridge in both St. Louis and Washington D.C., but also in Tokyo Japan! 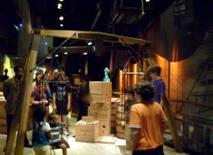 The last sculpture before going up in the Arch is a Mark Twain exhibit that includes a giant prohibition scale. While waiting in line children would take the opportunity to weigh themselves against each other and who ever was lighter thought they got to go up the Rainbow Bridge, I mean Gateway Arch first! This highly reminds me of the ancient Egyptian weighing of the heart ceremony. 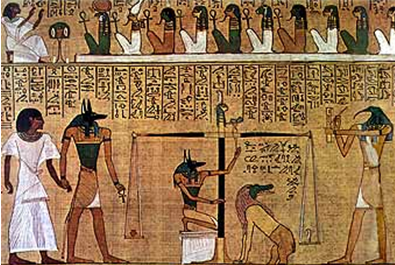 In ancient Egypt at the time of Judgment Day the heart was weighed on the scales of Maat (Justice) against that of a feather. If the heart weighed less than the feather the soul was granted permission to cross the Rainbow Bridge to the “Dimension of the Blessed”! Imagine my disbelief when the tram door opened in front of the light hearted children and the “pod” appears as a Sun with a door! A Sun – Door = Star – Gate, next stop top of the Rainbow Bridge! As I stood atop the Gateway Arch I pondered the Rainbow Bridge symbolism that was unveiled on my journey through the arch. 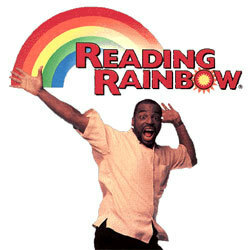 An immediate thought came to mind of my previous Rainbow U.F.O. 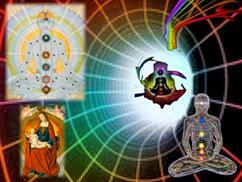 experience, was this what the perceived transmission that emanated from the rainbow trying to relay? “Investigate the rainbow”? Looking down at the Gateway Mall below, and feeling on top of the world, I had an intuitive sense that there was surely more symbolism to be discovered down there!. But before departing the Gateway Arch there is one more sculpture that stands tall and proud in the basement of the gateway. 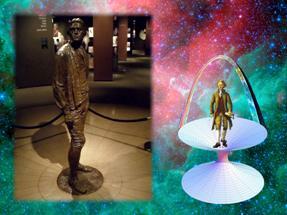 To my amazement, Thomas Jefferson stands in a “space-time continuum” in the heart of the underworld (basement) of the Rainbow Bridge (Gateway Arch)!!! 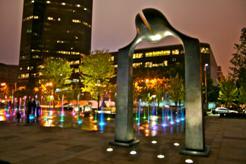 In 2009 a brand new sculpture park opened in the shadows of the Gateway that also contains some other worldly symbolism! Citygarden, a project of the City of St. Louis funded by Gateway Foundation, has developed three acres in the heart of downtown into an exhilarating urban oasis featuring modern and contemporary sculptures, lush landscape, reflecting pools, a cafe and playful spray plaza. 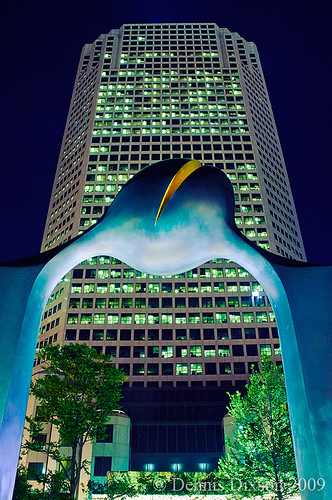 The Citygarden motto is “Free to explore. Free to play. Free to feel inspired.” **Below are a few of the amazing sculptures that are featured in the park. Considering I was on a quest searching for gateway symbolism, I was very excited to discover Tom Classen’s sculpture of Two White Rabbits that appear to be sitting on their rabbit holes! White rabbits have seemed to creep into the public consciousness of late. Usually being portrayed going through rabbit holes, wormholes, and to other dimensions. Contemplating the symbolism of white rabbits and rabbit holes it brings a few things to mind. The first being of course Alice in Wonderland, in which Alice descends down the rabbit hole! These White Rabbits also reminded me of several more recent movies including What The Bleep (Down the Rabbit Hole), as well as Knowing with Nicholas Cage. In Knowing two children are given two white rabbits before departing the planet with two light beings! 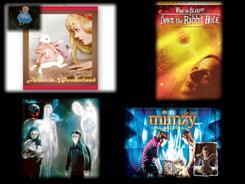 The Last Mimzy was another movie that used the symbol of the white rabbit. In this movie a scientist from the future sends back in time, of all things, a white rabbit! Are you prepared to go through the rabbit hole? Eros Bendato by Igor Mitoraj has the feel of an ancient relic that has been excavated and reconstructed. Originally Eros was one of the few primordial divinities including Chaos and Gaea. In this instance he was hatched from the cosmic egg and took on the personification of love and desire. As with many of the ancient gods Eros lineage and parents also changes over the years. 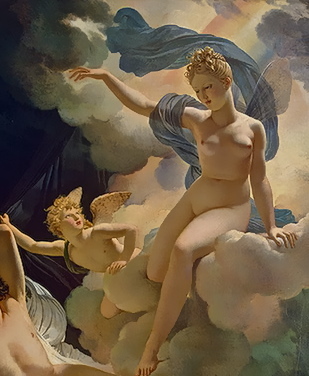 Eros was the son of Aphrodite and, Hermes in one of the lineages. In a more rare version concerning Eros’s lineage coming from a fragment of Alcaeus (327 LP) it mentions that Iris mated with the west wind, Zephyros, to become the mother of Eros. In Greek Mythology Iris is the personification of the rainbow and messenger of the gods. She is the goddess of the ‘Rainbow Bridge’ linking the gods to humanity. 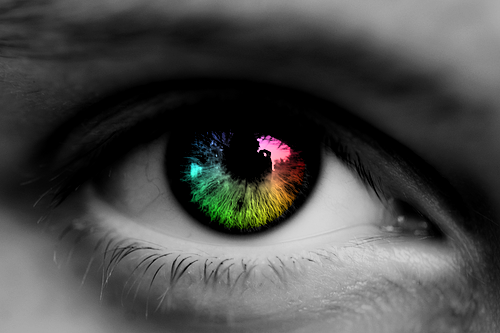 Of course the Iris is the colored part of the eye and is named after ‘Iris’ The rainbow goddess. Quite an amazing scenario presents itself when you have the opportunity to view the sculpture of Eros first hand. You have the opportunity to climb into the head of the sculpture and become the Iris of Eros!! 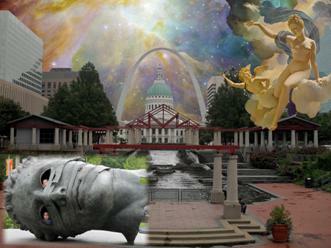 What you see looking out the Iris of Eros is the throne of Iris the rainbow goddess, the Rainbow Bridge or Gateway Arch! Another coincidence is the fact that when you look out the Iris of Eros your viewing the Gateway Arch created by Eero Saarinin! Leaving St. Louis my intuition was telling me that I may have made some rather profound discoveries regarding Rainbow Bridge and Gateway symbolism in and around the Gateway Arch. For the last year I have been delving into both the myth and lore of the “Shimmering Path” as well as the re-emergence of the Rainbow Bridge in pop culture. 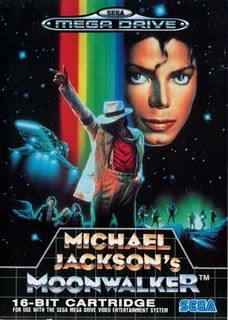 First let’s take a brief journey back in history and re-discover some of the symbolism incorporated within legends of The rainbow as well as the Rainbow Bridge. In Babylonian Mythology the rainbow veils of the Goddess Ishtar were sometimes garments, sometimes jewels. The rainbow was called her necklace, of which she made the bridge to heaven for souls of her chosen ones. Her rainbow necklace had selective power. If the Goddess willed, neither man nor god could cross it. On one occasion she placed her rainbow to block the Heavenly Father from receiving the food laid on earth’s alters, to punish him after he sent the Flood to destroy her earthly children. Biblical writers re-interpreted this Babylonian myth to omit the Goddess and make the rainbow represent God’s promise to Noah not to do it again. The rainbow’s seven colors represented the celestial spheres and the rainbow-hued veils of Maya, the Goddess working behind the veils to manifest the material world in its many colored complexity. Her priestesses wore the colors of the veils which appeared in Egyptian mythology as the seven stoles of Isis, and in the Bible as the seven veils of Salome. Ix Chel is the Maya Goddess of the Moon, Water, Weaving and Childbirth. She is shown here in three of her many aspects. 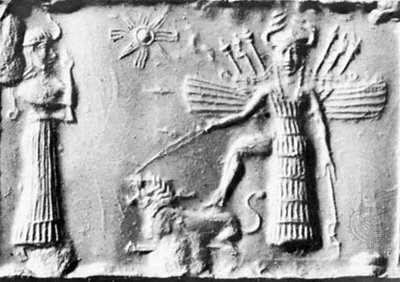 Left to right: Chak Chel, the Old Moon Goddess, called the Midwife of Creation; Ix Chel in Her main form as Mother Goddess and Weaver who set the Universe in motion; and the Young Moon Goddess, shown with her totem animal the rabbit. Ix Chel is a great Water Goddess, the consort of the chief God of the Maya pantheon, Votan. Her name means “Lady Rainbow”, and She is said to have founded the city of Palenque at the command of the Gods. She is a Weaver Goddess, whose whirling drop spindle is said to be at the center of the motion of the Universe. In Norse mythology, Bifröst or Bilröst was the burning rainbow bridge between Midgard, the world, and Asgard, the realm of the gods. It was the “shimmering path” between humanity and the gods. Heimdall was the guardian of Bifrost or the Rainbow Bridge. His role was to sit at the border of Asgard every day guarding the bridge against attempted crossings by giants. In Norse mythology Ragnarok is their “end of the world” or Judgement Day scenario. There seem to be many parallels with the Apocalypse portrayed by Christian writers. This is believed by some to be a prophecy that has yet to occur in which the world will go through great destruction before being re born. 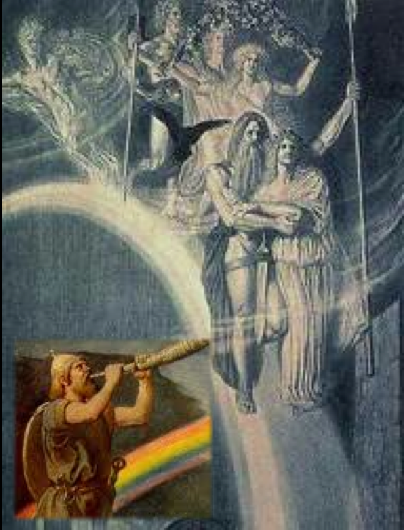 In this scenario Heimdall blows his Gjallarhorn to awaken and warn the gods of the impending spiritual battle to come. And Immediately I was in the spirit: and behold there was a throne set in heaven, and upon the throne one sitting. And he that sat, was to the sight like jasper and the sardine stone: and there was a rainbow round about the throne, in sight like unto an emerald. 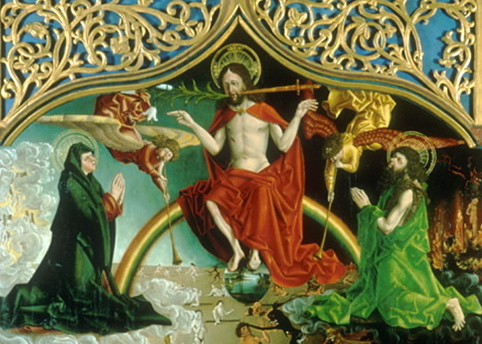 Looking close you will notice the two angels blowing their trumpets to either side of Jesus in this Judgment Day painting. This is obviously very similar to Heimdall blowing his Gjallarhorn at the time of Ragnorak, the Norse equivalent to the Christian Judgement Day. 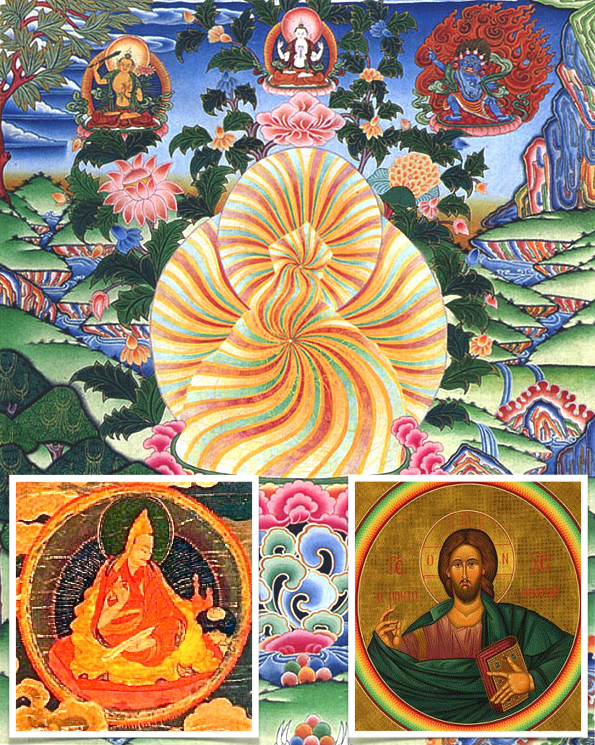 “ Tibetan artists used identical rainbow imagery to portray their high holy ones (called lamas) who have achieved “ The Great Perfection” (Dzogchen). “The Australian Aboriginal people believe the universe has two aspects – the physical world in which we live and another connected world from which it is derived called the Dreamtime. 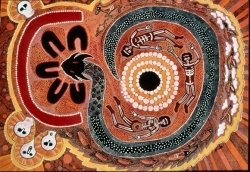 One of the most important dragons of creation mythology is the Australian Rainbow Serpent, its symbol being the rainbow bridging Heaven and Earth.” It is believed the Rainbow Serpent not only connects Dreamtime to this world, but links us to our past present and future. For more information on Australian Aboriginal Rainbow Myths click here. The Sunbow or Whirling Rainbow is a natural phenomenon appearing as a full 360-degree rainbow circle in a wide ring around the Sun. Wisdom keepers of the Americas and Tibet have complementary spiritual understandings about this dramatic omen known as the Whirling Rainbow or the Sunbow. For some traditional native people including the Navajo and Hopi, the Sunbow or Whirling Rainbow is considered to be a sign from Creator, marking a time of great change, or transition on the Earth. 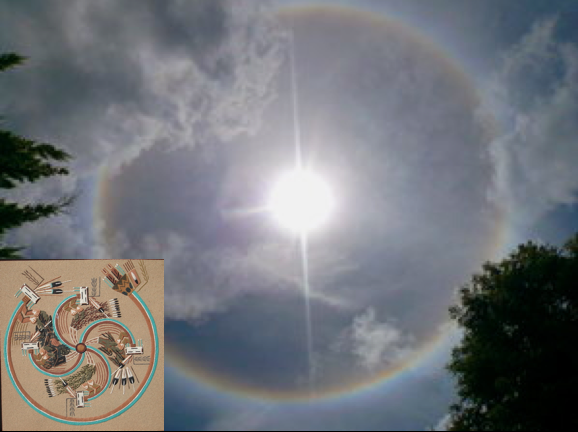 This full-circle rainbow around the Sun, some elders say, can be understood as a sign to people of the necessity to live a life in respect and harmony with all the creations that make life possible: plants, animals, waters, minerals, fires, winds, and other human beings. It is also believed that the “Shimmering Path” can be symbolic of our inner Rainbow Bridges, our chakra system! 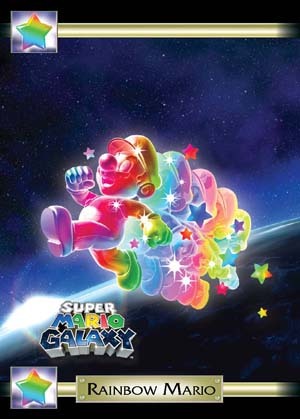 I propose that when we see enlightened figures such as are depicted on the left side of this image, and they are hovering in front of the rainbow colored rings, it is as if we are looking up into the end of the rainbow and these fully activated figures are the pots of gold at the end of the rainbow alchemically speaking! Is this something we can all do? I believe so! 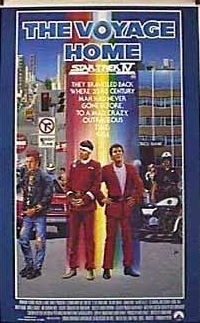 We could continue indefinitely looking into the myth and lore of the rainbow and the Rainbow Bridge. Almost every ancient culture has a myth in the rainbows recognition. Let’s move forward up the time line and look into the re-emergence of the Rainbow Bridge in modern times in art, architecture, and even pop culture. One mystery regarding the Queen Elizabeth Rainbow Portrait is the fact we can’t be completely sure of who painted this unsigned work, but it has been postulated by many that the style implies that of the French painter Isaac Oliver. In the painting you immediately recognize that the Queen is raising the rainbow while wearing a beautiful cloak with serpents on the sleeves and eyes (Iris) abound! She wears a blue jewel on her crown at the point of her third eye. Elizabeth was many times compared to the Greco – Roman goddesses of the moon (Blphoebe) and the dawn (Astraea). Especially interesting is the Elizabethan description of Astrae’s return to earth as a descent from heaven, an image that may imply a shimmering path. 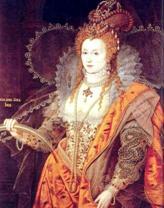 In 1602 there was a royal fete given for the queen. One of the most unusual gifts to the Queen was a rainbow-colored robe specifically intended to invoke the image of Iris. 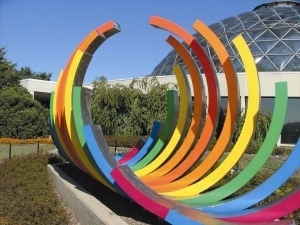 Over the last few decades the rainbow and the symbolism it incorporates has been working its way into architecture and sculpture world wide! Here are just a few of the many examples. 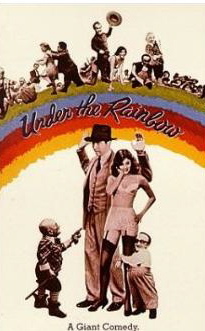 The rainbow symbolism has of course also worked its way into pop culture including television, movie, video games, commercials, advertisements, comic books, music and more! 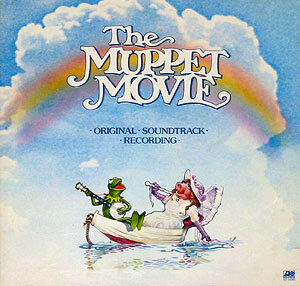 Kermit the Frog performs the Rainbow Connection! 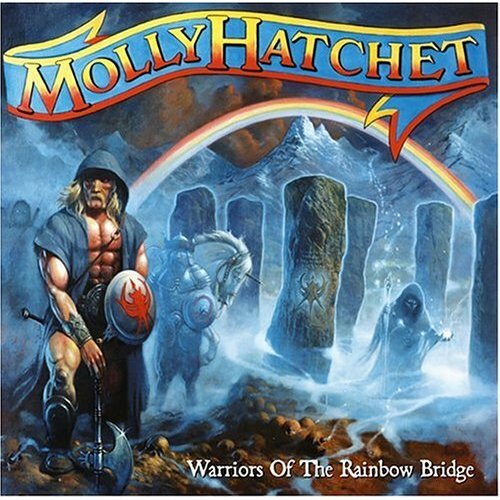 Another truly amazing scenario is the re-emergence of the Rainbow Bridge in music over the last several decades! Here we will take a brief look at not only some of the albums artwork and lyrics, but also the music videos that accompany them. 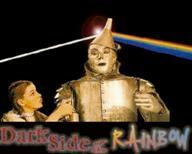 Pink Floyd is well known for their rainbow connection, but who would of thought that when you play Dark Side of the Moon in conjunction with the Wizard of Oz that they would synch so nicely!? The Great Gig in The Sky : Youtube Clip, Click here to watch. While researching the Rainbow Bridge in regard to art, architecture, and especially music, one number in particular keeps making itself evident, 72! The number 72 is a sacred number in general, but according to Graham Hancock the number 72 is what he refers to as the “Ruling Number of the Code”. This number and dividends of it, have been found incorporated in ancient art and architecture around the world and is most likely symbolic of the Precession of the Equinox. This revelation proceeds at the rate of one degree every 72 years. A complete precessional cycle takes approximately 26,000 years, coming to a completion in 2012! Let’s take a look at the re-emergence of the Rainbow Bridge in conjunction with the sacred # 72. 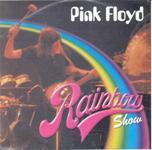 Pink Floyd performed a “Spacey” show on 2 -20 -1972 at the Rainbow Theater in London! 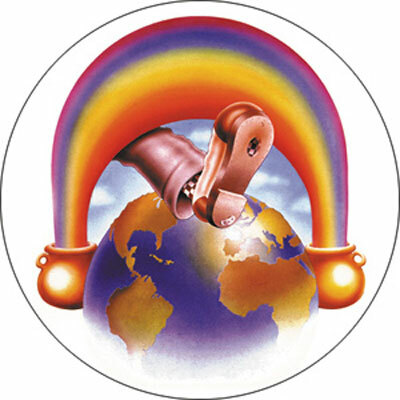 The Grateful Dead used the rainbow as a logo on their European 1972 tour. Of course followers of Dead wear rainbow colored tie-dies and gather annually at Rainbow Gatherings. 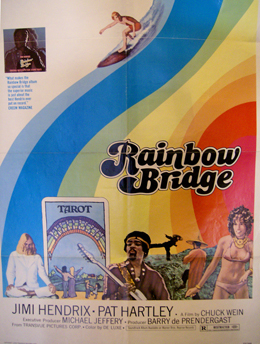 Rainbow Bridge is a 1972 film that features footage from a JImi Hendrix concert that took place atop a volcano in Hawaii. A modest audience of a few hundred island surfers, hippies, and students turned up following announcements that Hendrix would play a free concert for a film. Many of the Stargate Parks that myself alongside of William Henry and Mark Gray have been investigating have emerged on pieces of sacred landscapes. 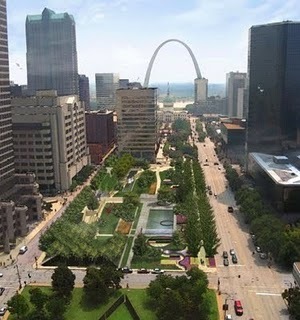 The Gateway Arch in particular is only a few mile from the ancient “City of the Sun”, known to most as Cahokia Mounds. 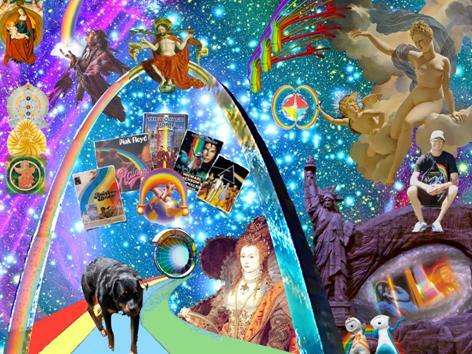 Could there be 72 symbolism to go along with the Rainbow (Gateway) Arch? 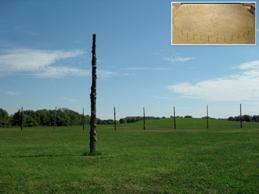 Of in particular interest is Cahokia’s Woodhenge. Scholars believe it was a solar horizon calendar that enabled the Cahokian’s to track the suns movement as a way of determining important dates. Excavations show the hedge growing in both size and number of post over the years. It is felt the Woodhenge was rebuilt five separate times, the first having 12 posts surrounding a central pole, and the fifth had it been completed would have had 72! The interpretive center claims,” Why this structure kept changing in size and number of posts remains a mystery.” I ponder, Could those at Cahokia have recognized the significance of the sacred number 72, and possibly its relationship to to the Precession of the Equinox (coming to a close in 2012)? Approximately only one percent of Cahokia has been excavated to date. 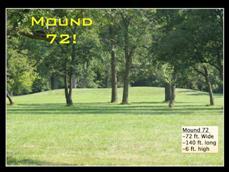 When they finally decided to dig into this small and obscure mound towards the back of the property they took measurements and realized it was 140 ft. long and 72 ft. wide and decided to name it mound 72! Mound 72 yielded a spectacular array of relics numbering in the tens of thousands! But more importantly the sacred mound was the final resting place for some three hundred natives and even a possible king, or leader. 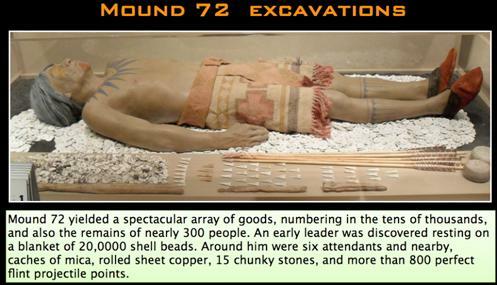 The most important discoveries, all in mound 72!! Recall that in William Henry’s and Dr. Mark Gray’s research they unveiled the fact that the Father of the United States is hovering on a Rainbow Bridge in a heavenly scene in a gate of 72 stars! 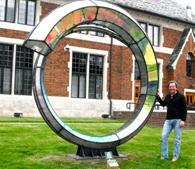 “A Stargate”! So what kind of symbolism will emerge at the 2012 Olympics in London??? A twisting red steel tower by acclaimed Indian-born artist Anish Kapoor will keep watch over London’s 2012 Olympic Stadium. 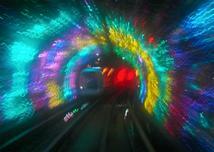 It highly resembles a giant wormhole! This is the same artist that created Cloud Gate in Chicago’s Millennium Park (Stargate Chicago). 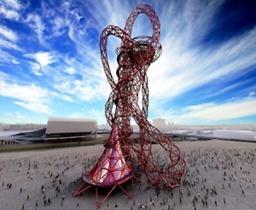 Kapoor described the tower, to be known as ArcelorMittal Orbit, as the “commission of a lifetime”. 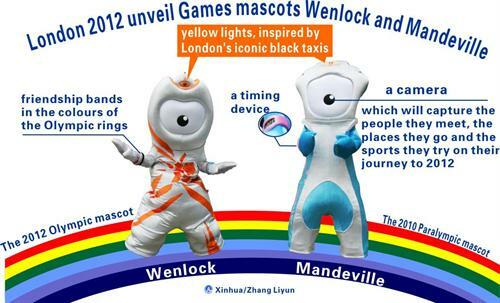 Getting back to the Rainbow Bridge theme, meet Wenlock and Manderville! 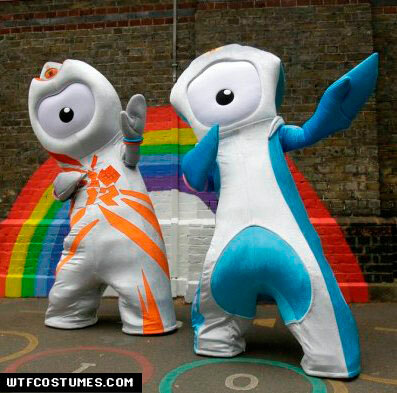 These one eyed, rainbow riding creatures are the mascots for the 2012 Olympics! 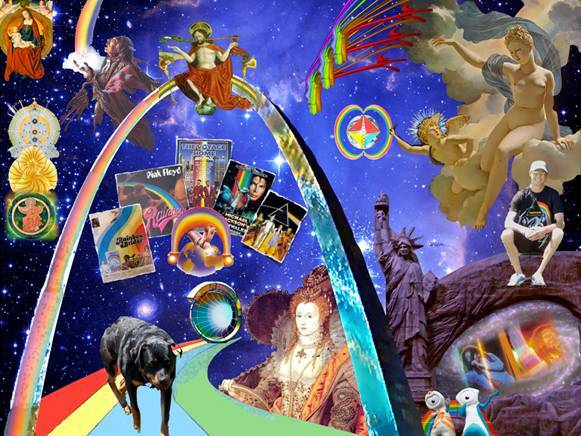 Will the Rainbow Bridge manifest in 2012? Will the gates at the end of the “Shimmering Path” be unlocked? While investigating the Rainbow Bridge over the last year, there has been one question continually in the back of my mind. Was this what my previous U.F.O. experience was relaying by “Investigate the Rainbow”? I believe that I recently had an amazing personal confirmation that I’m on the right trail. Back in 1999 me and my beautiful wife had just got married and made a spur of the moment move from MIchigan out to the Oregon coast. One afternoon on a stroll through downtown Eugene we had an urge to go into a pet store that we just happened to be passing by. Only moments after entering the store we were both drawn towards a tiny puppy in the back corner of the shop. Sitting proud, yet looking lonely, a handsome six week old Rottweiler/Lab pup, wearing a red bandanna, was piercing our hearts with his loving eyes. Needless to say, he was coming home with us. Driving to our new home in the hills the puppy was introduced to our other dog Zoey. As they rolled with glee in the back of the van we pondered what to name the little guy. In the background Bob Marley was playing, “Sun is shining , weather is sweet, makes ya want to move your dancin’ feet”. Looking at each other with smiles we both instantly confirmed that the new edition to the family would be named Marley. Not knowing it at the time, Bob Marley is one man who truly took on the personification of the rainbow. He was a freedom fighter that emanated love! Marley many times included rainbows in his lyrics and even song titles. 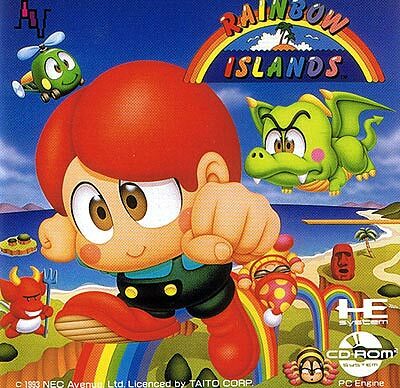 One of my favorites happens to be Rainbow Country. 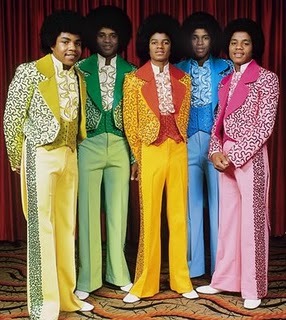 And another classic is Sun is Shining, “When the morning gathers the rainbow, want you to know I’m a rainbow too.” Then on his birthday, and one of his last performances in Europe he played a legendary show at, of course, The Rainbow Theater! Returning to Marley the dog, over the last year he was my biggest fan so to speak. This year I began giving talks on stargate symbolism hidden in plain sight within our cities. Being a rookie I felt the need to rehearse my slide show at home, alot! Every time I would set up the projector my other two dogs would usually leave the room, while Marley would plop on the couch and prepare for the show. The funny thing was, every time I would get to Stargate St. Louis and discuss the Gateway Arch and the Rainbow Bridge, Marley would seem particularly interested! He would turn his head back and forth towards the screen in what appeared to be a state of fascination. 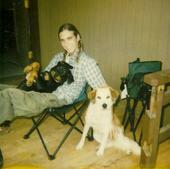 The inside joke between me and my wife was, “ If any dog knew how to cross the Rainbow Bridge it would be Marley”. The reason for telling this story is that my best friend, Big Marles, was diagnosed and sick with pancreitis this past year. A few months ago his rainbow soul passed on. One evening he was laying on the floor not looking so good and I decided to curl up next to him. For some odd reason I whispered in his ear that he didn’t need to suffer, he could go when he was ready. About a hour later my wife arrived home from work, this was usually Marley’s most joyous part of the day, Mamas home! But this time when he jumped up to greet her he fell back over. By the time we could reach the emergency clinic he had passed on. He had waited for his Mama to get home. I can honestly say I have never encountered a being on this planet that oozed love and devotion like the big guy! Needless to say I was devastated for the next week, almost to the point of depression. Having a speaking engagement the following weekend, I was unsure if I even wanted to go. Then something quite incredible occurred. I had just picked up the bag containing Marley’s ashes from the vet. Heading home I decided to open the bag and see how he was presented. Opening the bag I first noticed a nice little tin containing the ashes, and one other thing, in the bottom of the bag, a bookmark. Pulling the bookmark from the bag I was in awe. A Blue bookmark with a poem entitled – The Rainbow Bridge! When an animal dies that has been especially close to someone here, that pet goes to Rainbow Bridge. There are meadows and hills for all of our special friends so they can run and play together. There is plenty of food, water and sunshine, and our friends are warm and comfortable. All the animals who had been ill and old are restored to health and vigor. Those who were hurt or maimed are made whole and strong again, just as we remember them in our dreams of days and times gone by. The animals are happy and content, except for one small thing; they each miss someone very special to them, who had to be left behind. They all run and play together, but the day comes when one suddenly stops and looks into the distance. His bright eyes are intent. His eager body quivers. Suddenly he begins to run from the group, flying over the green grass, his legs carrying him faster and faster. You have been spotted, and when you and your special friend finally meet, you cling together in joyous reunion, never to be parted again. The happy kisses rain upon your face; your hands again caress the beloved head, and you look once more into the trusting eyes of your pet, so long gone from your life but never absent from your heart. For the previous couple of weeks before Marley passed on I was really delving into my research and would have books stacked next to me in a disorganized fashion. I complained to Lisa on several different occasions that I really wanted to pick up some bookmarks. Surely Marley would have heard my nagging as he sat next to me on the couch. And oh yea, my favorite color has always been blue. So for me, when I opened the bag and discovered a Blue bookmark with a poem called The Rainbow Bridge, I was shocked. For me personally this was confirmation that Marley scaled the “Shimmering Path”. Marley’s favorite toys were the Rainbow Trout & Alien! Come to find out, in modern times the Rainbow Bridge is many times viewed as a bridge for our beloved pets to the beyond. Doing a little research I was pleased to find some other companions that may be keeping Marley company. Check out this guy. His name is Stargate and he too crossed the Rainbow Bridge. From Stargate’s memorial page: Stargate will be remembered for his presence of a stallion and no mistaking that he wasn’t a male. He had a gorgeous masculine head with loving eyes. He was gentle and young at heart, still thinking he was a puppy. He learned from watching, loved his kong, playing ball and helping mom with the pups. After having what I felt was some sort of confirmation that Marley was still kickin’ it on the other side, I decided I would make my speaking engagement after all. At this point I could once again look forward to the up and coming weekend. After all, I was being given the opportunity to speak alongside friend and colleague William Henry, and do so in the confines of a close knit group of warm hearted folks. Long story short, it was a great weekend, and the theme of the weekend surprisingly seemed to be the rainbow. The first few hours of William’s talk he discussed the Rainbow Throne of Jesus, George Washington riding a Rainbow Bridge in our Capital Dome, and even the Tibetan practice of the Great Perfection and the achievement of the Rainbow Body! If that wasn’t enough he concluded his talk with some amazing revelations in regards to Jesus and the Seraphim! Following William I gave my Stargate Detroit talk and focussed quite a bit on some of the rainbow symbolism found there. Following our presentations we had the opportunity to discuss the fact that rainbow symbolism appears to be showing up everywhere! We then said our goodbyes before I was to depart on my four hour journey home. Before leaving William poked his head out the door one last time relaying, “Watch out for those gates!” I told him I would and chuckled as I left. Now on my own and on the open road, I had a sense of gratitude for the fact that not only the weekend had went so well, but the overall theme was perceivably rainbows. It almost felt as if my Big Boy Marley had accompanied me ( in spirit) on this journey. I know, I know, thats crazy talk! Only a few minutes after leaving the (rainbow) gathering it began to storm heavily. All of the sudden all of the lights in my vehicle came on. On my dashboard it began flashing…Gate..Gate..Gate. I pulled off the road and checked my back gate. Although it appeared closed I slammed it a few times until the flashing Gate signal finally went off. I had a chuckle at the coincidence and was on the road again. About another ten miles up the road this occurred once again! Gate…Gate…Gate… and the entire interior of the car bathed in light. Knowing my gate should surely be closed, I pulled off the road again. After slamming the gate, doors, and putting the car into neutral a few times, I finally got the madness to stop. Returning to the stormy highway I was quickly slowed down by traffic and flashing red and blue lights. Ahead appeared to be a horrific roll over accident. A fleeting thought went through my mind, “What if that could have been me?” Slowly driving by the accident I was shocked to see it was my identical vehicle! A 2010 Blue Jeep. Pulling off at the next exit I called my Wife and relayed the Gate experience, and how it almost appeared as if my travel time had been manipulated in some strange way. Put it this way, I almost pulled off and got a hotel room for the night at this point. That being said, I figured fate (or Marley) must be on my side, “I’m headed home.” The remaining three and a half hour journey my dome lights, and entire car stayed illuminated while my dashboard flashed Gate…Gate…Gate…! I planned on taking the car in for repairs on that following Monday, but believe it or not, The lights nor the gate signal never came on again. Returning home the next day the decision was made to make the trek to the back of my property where we buried some of Marley’s ashes. In a conspicuous mound we buried his ashes and surrounded them with crystals and flowers. Sitting on the mound surrounded by crystals I thanked Marley for what I perceived to be some kind of messages (or something) in regards to the Rainbow Bridge bookmark and the “Gateway” experience. Perched on the mound with incense engulfing the air, I was feeling very thankful. At that moment my phone rang. My wife would be home momentarily. I relayed that I was out paying my respects at Marley’s mound, maybe we should meet out by the field, something we have never done before or since. As she pulled through the field an unusual warm presence seemed to fill the air. As Lisa got out the vehicle I mentioned to her that I felt like there was going to be a rainbow. She looked at me a little strange considering it wasn’t remotely like rainbow weather. Backing up so I could see the sky beyond the tree line, I pointed up. Look! 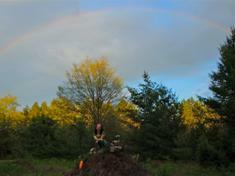 To our disbelief a beautiful rainbow emerged and was hovering above Marley’s sacred mound! Once again he waited for his Mama to get home. This was her confirmation that Big Marles had crossed the Rainbow Bridge. The Rainbow Bridge and all its glory has sparked the imagination for thousands of years right up into our modern times. The “Shimmering Path” has been viewed as a communications link between the Earthly realm and the Heavenly realms, between humanity and the gods, and possibly even a bridge linking us to our departed loved ones. If someone would have told me a few years ago I would be writing a lengthy article on rainbows and their symbolism I would have probably laughed hysterically! That said, my research into the Rainbow Bridge, and the experiences that came in conjunction with it have truly changed my perceptions. Not only has my perception changed in regard to rainbow symbolism, but also the art and architecture helping to bring it back into fruition. Not only that , but it has helped to change my views and perceptions in regards to life and the world in general. I believe that may be one of the powerful secrets of the rainbow. No two people perceive the exact same rainbow scientifically speaking. The rainbow and the “Shimmering Path” may be cosmic catalyst to opening our hearts, sparking our imaginations, and activating our inner Rainbow Bridges. With these new found perceptions we may be able to begin scaling the Shimmering Path to the Gods.